A stirling engine is an exceptionally efficient energy-extracting device that retrieves energy from the heat difference. It can easily be build from freely accessible materials and inexpensive tools. Any source of energy like sun, burning wood, candle or even the warmth of the hands can be used to run the device. Here is a step by step procedure to build a stirling engine. In the first step, take the coke tin and cut it in such a manner that it becomes a hollow cylinder. Now, cut it into two halves. Take the bottom half and cut its sides and bend them to form the three-legged ring stand. Likewise, create the ring stand of the other half. For the pressure vessel, take another coke canister and cut off the top portion. This piece will form the bottom portion of the pressure vessel. For the top portion of the vessel, take yet another coke can and cut it approximately 2-inches from the bottom. In the bottom part of the vessel, drill a hole in the centre. Affix a bolt and steel plate on the inner side with the help of glue. For making the displacer, take red bull canister and cut in the same manner as the pressure vessel. Fix it inside the vessel and make certain that there is no leakage. For making the crankshaft, use coat hanger. Cut the hanger into a straight rod that is bent to form a handle at one end. Insert the crankshaft into the hole punched on the sides of red bull can. Ensure that the handle moves freely. In the last step, cut the balloon to form the diaphragm that connects the crankshaft to the disc. It should be strong enough to endure heat and movement. 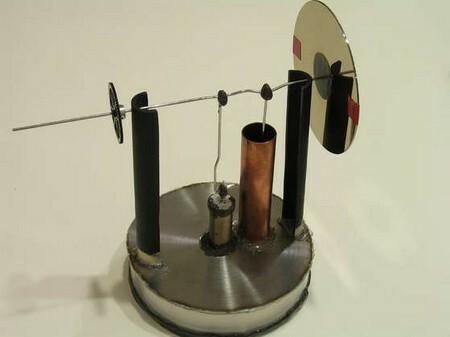 Heat the stirling engine gently for 20 to 30 seconds. Push the flywheel tenderly; if is starts rotating on its own, then the project has been successfully completed, else some alterations have to be made. 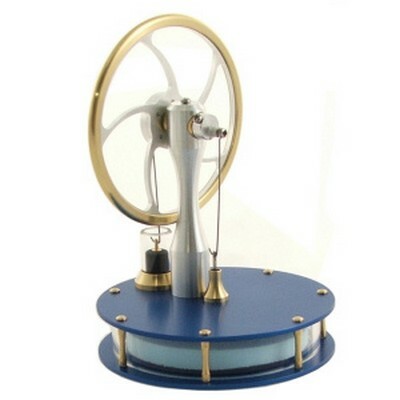 In order to ensure that the stirling engine keeps on extraction energy proficiently, constant cooling is essential. For this ice cubes should be place on the top the pressure vessel. Under no circumstances water should penetrate into the vessel. This is the only precaution that should be properly addressed.